The Lancia Dialogos is a concept large executive saloon, presented to the public at the Turin Motor Show in 1998. It's styling and many of its ground-breaking safety features evolved on the Thesis production saloon. The Dialogos aims to express the fundamental ideas of Vincenzo Lancia, the founder of the marque. Namely, he when said that his products would demonstrate excellence only then when they offered to customers much more than expected at first sight. That is the thinking behind the doors of this prototype opening book-like: the hinges are mounted on the side arches of the bodywork, in the same fashion as they used to be in many Lancia saloons of the 1950s. It is believed that even without a cental B-pillar the Dialogois complies with EU crash test regulations. The steering wheel assembly is positioned in the middle of the dashboard so that the driver and the front passenger can pass it to each other mutually exchanging their roles. The front seats swivel through 90º to allow easier access ( and can move a maximum of 180º ) while they can slot together to form a "sofa". The interior is trimmed in Nabuk, which is similar to Chamois. The whole passenger compartment of this 5-metre long saloon is designed as a living room with key attention focussed on creating an idea micro-climate and a stress-free driving environment. However, Dialogos is far away from being exciting only for its design and styling. It incorporates a number of innovative new safety features under development by Fiat. These include Multi-Entry Climate Control, Adaptive Cruise Control, Evolutionary Cruise Control, Anti-Collision Warning System, Lane Overtaking Warning System, Ego Mode Interactive Robotised Gearbox and an Active Differential. Choosing tradition as the starting point for the design of tomorrow's car may seem a contradiction in terms. Not for Lancia. Because the future always benefits from a return to the past, when loving craftsmanship and technological innovation were two sides of the same coin. To be unique, an object must convey much more than is immediately apparent. The message is in the details, in the parts. But above all, it is in the animating spirit. Lancia cars have always lived by these principles. They imbue every model with a very special appeal: a desire to turn heads coupled with the satisfaction of discretion. The basic guidelines may be the same, but the interpretation is quite different. The design of the Diàlogos contains a wealth of stylistic references to the most prestigious Lancia models. The car's impressive dimensions are lightened by uncluttered profiles and seductive curves. Unhindered by intrusive door handles or door mirrors, the gaze is free to wander beyond the normal boundaries, inside and outside the car. This good-looking blend is everything a Lancia of the future should be. Technology truly harnessed to man's needs. All these factors combine to create a new concept. A concept that sees the car as not just a vehicle to be driven but a space to be inhabited. Capable of arousing all our senses. Without the center pillar, the act of getting into the car is like entering a comfortable lounge, where new sensations of ease, wellbeing, and harmony are ideally catered for. Luxury, not ostentation. Innovation, but without losing sight of timeless values. A flexible approach to different needs. Functionality, because we know how to make cars as rewarding an experience as possible. Vincenzo Lancia's passion for essential but elegant details was born of a very clear vision. The desire to transmit something else, something different from mere physical or visual contact, through meticulous craftsmanship. The emotional ability to make original ideas appealing. With care, technical ability and, above all, the desire to produce something living, exclusive and élite. This is why a Lancia is always unique. Living Room, Ideal Microclimate, Stress-free driving. - A combination of quality, breeding and emotion conveys the sensation of an environment that is elegant yet home-like. Your very own living room. - The climate, sounds, sights and smells convey the idea of a protective, healthy, beneficial environment. - Sophisticated technologies are cleverly used to stay one step ahead of motorists' demands and adapt to their habits, moods, and current mental and physical conditions. This is an automatic air conditioner using novel new principles. The main difference is the system does not have the traditional series of channels with flaps for cold or warm air. The air comes to the cabin via a large number of small apertures in the roof, the floor, the seats and the dashboard. Such a system is much less aggressive, almost inaudible, and it enables setting micro-climate conditions for each seat separately. The system automatically warms or cools down those spots in the compartment deviating from the pre-set temperature. Especially effective factors offering convenience are the seat holes as they control the temperature of those parts which are in direct contact with the body. Controls the settings for desired pre-set speed, taking into consideration also safety distance. By using microwave radar in front of the car it monitors what is happening in front of the Dialogos. If the car is approaching to another slower car it automatically applies the brakes as required. The ACC system has some interesting features. If at a pre-set speed the Dialogos approaches a vehicle in front, then the ACC slows down so that the Dialogos keeps to a predetermined safety distance. The Dialogos will now allow overtaking of the car by depressing the accelerator, overriding the ACC system. A further option involves changing the lane. If the lane is empty the ACC will automatically accelerate, however, if the overtaking lane is not empty, the ACC will limit the increased speed to enable safe overtaking by maintaining safety distance. Third option is to change the lane and set higher speed. This is an upgrade of the ACC. Fiat is testing this system within two European projects, namely, Urban Traffic Monitoring and Collision Prevention System. In addition to the radar the system has three laser sensors in front. The system is logged in the city information system accessing the information about the traffic lights (i.e. green, read) ahead of the car. As the safety distances in the city are very short the system is quite sophisticated but at the stage achieved so far it already enables keeping safety distance in such circumstances. The driver can also select Automatic Stop and Go mode. Intergrated into the ACC and ECC systems, the system gives audible and visual signals ( on a safety display screen ) to recommended safe vehicle position distance. The system has been particularly designed for poor visibility conditions. The Lane and Overtaking Warning System (LOW) enables safe overtaking and changing of the lanes. The system involves three cameras which give a full visibility, including covering the "blind spots" of the rear mirrors. At the same time it gives a warning to the driver if on the overtaking lane there is a car travelling at higher speed approaching from behind. The Ego Mode Interactive Robotised Gearbox is not only an automatic gearbox. The system is adaptive and learning. At the beginning the driver can select learning mode. Then he drives few minutes by changing the gears manually. After the system learns the driver's style of changing gears it gives the driver a signal, the driver can switch to automatic mode. A special feature of this system is that it can memorise and five driving styles to a memory card, the so called Ego Card that can be used later without need to learn again, or transferred to another vehicle using the system. The Lancia Dialogos has an active differential that operates with different principles to a normal self-locking differential. Two specially constructed electro-hydraulic elements automatically change the driving ratio between the left and the right wheel, relating to conditions around the car and the driver's actions. The ratio can vary from 0 to 100 % giving more power to the road wheel which has a better traction or which needs greater traction to stabilise the vehicle. The system can also adapt itself to the driver's style of taking turnings - which can also be saved on the Ego memory card. The Dialogos has multilink suspension front and rear. The most interesting feature of the front suspension is its virtual steering axis. The steering axis passes through the center of the wheel, so obstacles such as potholes or uneven surfaces do not cause the wheel to vibrate or turn. The device ensures that steering is unaffected when the active differential applies different pulling forces to both half-axles for increased stability. This suspension architecture also ensures high longitudinal stability and reduces vibrations from the road surface to improve car handling. One of the most innovative features of the multilink rear suspension is its virtual pitch centre. When riding over an obstacle, the wheel moves back to reduce interference transmitted to the body. The Lancia Dialogos was styled by Mike Robinson at Fiat Centro Style. Starting in 1996 he was given a clean sheet of paper to come up with a "dream car" which would lean heavily on Lancia traditions, while being a futuristic mobile technology "laboratory". By 1997 he had come up with a shape and in 1998 the Dialogos was presented to the public. - the Dialogos idea was expanded further with drawings and scale models of an estate version being produced. The estate concept built upon the "living room" theme with a further utilisation of space being put to maximum use. 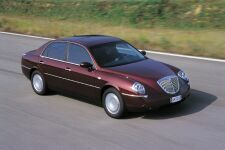 The Lancia Thesis executive saloon, introduced during 2002, drew heavily on the styling and put into practice much of the ground breaking technology trialled on the Dialogos concept car.